4KR1100AAU-TS-JR: 4.8volt 1100mAh NiCd battery for TACTIC RC transmitters. UPGRADED SPECIFICATIONS. Now made with 1100mAh NiCd cells. Includes connector. 9.6 volt rechargeable battery Insert for AIRTRONICS STYLUS (95050) or QUANTUM Transmitter packs. These go inside the plastic casings for Stylus and Quantum battery packs. Choose from 700mAh (NiCd) thru 2700mAh (NiMH) capacities. 4EN2000AA-TS-JR : 4.8volt 2000mAh eneloop NiMH battery for TACTIC RC transmitter. PRE-CHARGED & READY TO USE ! 9.6TX-FLAT-AA: 9.6volt rechargeable FLAT shape battery for RC transmitters. Choose Capacity (700mAh, 1100mAh NiCd, 1650mAh, 2000mAh eneloop, 2500mAh NiMH, 2700mAh NiMH), and Connector. Replaces NT8JY, NT8F700B, 54116, 54123, 54115, etc. 2S2300SD-10: 7.4v 2300mAh rechargeable LiPO battery for Airtronics SD-10G transmitters. 2S2300Rx: 7.4v 2300mAh rechargeable Li-PO battery for RC receivers. Fits JR, SPEkTRUM, Futaba, HiTEC, Airtronics Z. Has universal male Rx connector and JST-XH balance charge connector. 10.8 volt Transmitter Battery Pack w/ wire leads : 3x3x3 style (for Aristocraft, World, Expert, 720, etc). Made with SANYO cells. Choose from Ni-Cd & Ni-MH Capacities. Pricing starts at $24 for 700mAh capacity. Net pricing reflects options chosen. 9.6 volt replacement battery Insert for AIRTRONICS INFINITY Transmitter packs. Choose from 600mAh NiCd, 1100mAh NiMH, 1600mAh NiMH, or 2150mAh NiMH. These battery assemblies go inside the Airtronics battery cartridge. NT8S700B : 9.6 volt 700mAh rechargeable Ni-Cd battery for Futaba RC transmitters. Fits models such as Futaba 10C, 10CAG, 10CHG, 10CG, 6DA, 6VA, 6NFK, 6YK, 7NFK, 7CAP, 8AUT, 8UHF, 8UHP, 8UI, 8UA, 8UAFS, 8NFK, NT8C, NT8iB, 8UAF, 8UAP, 9C, 7C, & more ! JR-1: 9.6v rechargeable battery for JR PROPO transmitters. Choose capacity. Base model is 700mAh, priced at $25.95, which replaces original JR-1 packs. JR-2S: 9.6 volt battery pack for JR transmitters - choose Capacity. JR-2S: 9.6volt rechargeable battery pack for JR PROPO transmitters. Replaces original battery # JR-2S. Includes white connector. Choose capacity (price varies with capacity). NT-8JY: 9.6volt rechargeable battery pack for Futaba transmitters. Replaces NT-8JY, NT8JY etc. Choose capacity: 700mAh NiCd, 1100mAh Ni-Cd, 1650mAh NiMH, 2000mAh NiMH, 2500mAh NiMH, 2550mAh NiMH, or 2700mAH Ni-MH. NT-8H : 9.6v rechargeable battery Insert for Futaba FG & FGK (GOLD) series transmitters. Replaces original NT-8H battery. Choose from 700mAh Ni-Cd, 1100mAh Ni-Cd, 1650mAh Ni-MH, 2000mAh ENELOOP NiMH, 2500mAh NiMH. Connector is $3 extra. 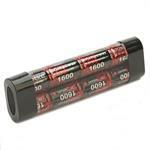 JRPB958 : 9.6 volt rechargeable battery for JR Transmitters. Tip Clip style. Replaces original JR battery part # JRPB958. Choose capacity from 700mAh NiCd up to 2700mAh NiMH. Battery pack has 9.6 volt snap-style connectors. 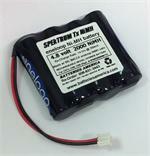 3S2200TxA: 11.1 volt 2200mAh Li-PO battery pack for RC transmitters. Replaces 9.6v FLAT style battery packs. Size: 3 7/8" x 1 5/8" x 1/2". Fits Futaba, HiTEC, JR, SPEkTRUM radios. ACE 2946: 9.6 volt 1100mAh battery for ACS RC Innovator. Replaces original part # 2946. These battery packs are made in the USA by BATTERIES AMERICA. NT-8A: 9.6 volt 1100mAh Ni-Cd replacement battery insert. Goes inside Futaba NT8A battery case and NT8S1100 battery case. 5HRAULAF: 6 volt 2150mAh rechargeable NiMH battery for Futaba RC transmitters such as T8J, 6J, T4PK, 4PKS, 4PK FASST, 4PL. Replaces HT5F1700B, HT5F1800B. NT8iB : 9.6 volt 1100mAh rechargeable NiCd battery for Futaba transmitters. Fits 6, 7, 8, 9, and 10-channel radios. Replaces NT8iB, NT8S700B, etc.